The 2016 Chrysler 300 is a gorgeous full-size sedan that honors the brand's history of creating refined and innovative vehicles. As the ultimate American sedan, the Chrysler 300 is luxurious and comfortable, making it a wonderful option for families. Furthermore, the fantastic powertrain is driver-oriented and will create an exciting daily ride. For 2016 the Chrysler 300 will receive an upgraded suspension with the base Limited trim, and the brand is offering a 90th Anniversary Edition package to honor Chrysler's amazing history. Other new features include a great SafetyTec Plus package, enhancements to the driver-oriented 300S trim, and Siri Eyes Free with the Uconnect touchscreen. Chrysler equips their phenomenal 300 model with the award-winning 3.6-liter Pentastar V6 engine. This engine will offer 292 horsepower and 260 lb-ft of torque with most of the trim levels, though customers who choose the performance-oriented 300S model will have a Pentastar that offers 300 horsepower and 264 lb-ft of torque. Linked to every Chrysler 300 is an eight-speed automatic transmission, and though rear-wheel drive comes standard, the 300 can instead be equipped with all-wheel drive for a great performance in a variety of weather conditions. The 2016 Chrysler 300 can also be powered by a 5.7-liter V8 engine, which will produce 363 horsepower and 394 lb-ft of torque. This V8 option will come with the excellent rear-wheel-drive system. As a full-size sedan, the 2016 Chrysler 300 has comfortable seating for up to five passengers. There are four trim levels offered, including the 300 Limited, 300S, 300C, and 300C Platinum. Every trim is beautifully equipped with a wide range of standard features, leading to a sophisticated experience at every price point. Some of those standard highlights found in the 300 Limited include keyless entry/ignition, dual-zone automatic climate control, leather upholstery, and LED daytime running lights and taillights. A fantastic 8.4-inch Uconnect system is also standard, along with a six-speaker sound system, satellite radio, USB port, and auxiliary audio jack. WiFi hotspot access is standard, as are voice controls and Bluetooth connectivity for both phone and audio. 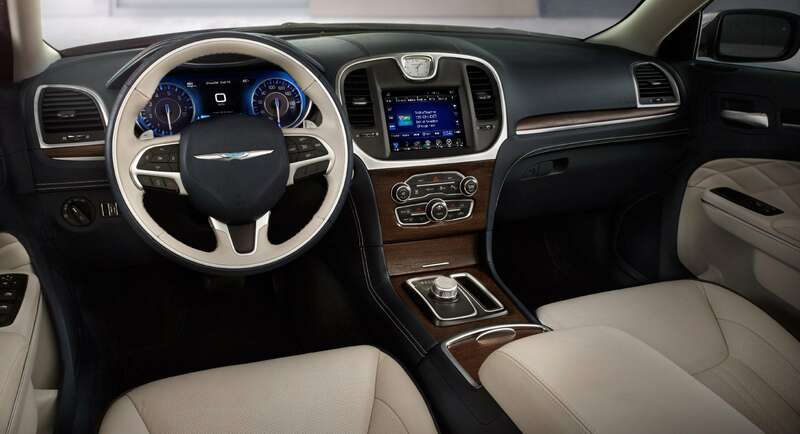 Chrysler offers many of their high-end features as standalone options on each trim, making it easy to customize every trim. Additionally, the available 90th Anniversary package features unique badging, a dual-pane sunroof, and a navigation system. Are there any specials taking place this month? Absolutely, and you can find the specials taking place in our Garden City location right here! Can leather upholstery be equipped with the 300S model? The 2016 Chrysler 300S comes standard with Nappa leather-trimmed performance seats, giving the vehicle an incredibly upscale atmosphere. Where can I take a look at the available 2016 Chrysler 300 models? You can find our new 2016 models by heading over to our New Chrysler 300 Inventory! The 2016 Chrysler 300 has earned amazing safety scores from the government and Insurance Institute for Highway Safety. Notable standard safety equipment includes traction/stability control, antilock brakes, a rearview camera, and active front head restraints. The Uconnect Access system comes standard with automatic crash notification, remote door unlocking, stolen vehicle assistance, and on-demand roadside assistance. The available SafetyTec Plus package will equip the vehicle with blind-spot monitoring, rear cross-traffic alert, lane-departure warning and prevention, and forward collision warning and mitigation. Have you been curious about the 2016 Chrysler 300, and would you like to set up a test drive? If so, just give us a call or stop in today at Suburban Chrysler Dodge Jeep RAM of Garden City!